For my project, I created a set of snowflakes using the new Simply Snowflakes stamp set (and coordinating die-namics), along with the new Stylish Snowflakes Die-namics. 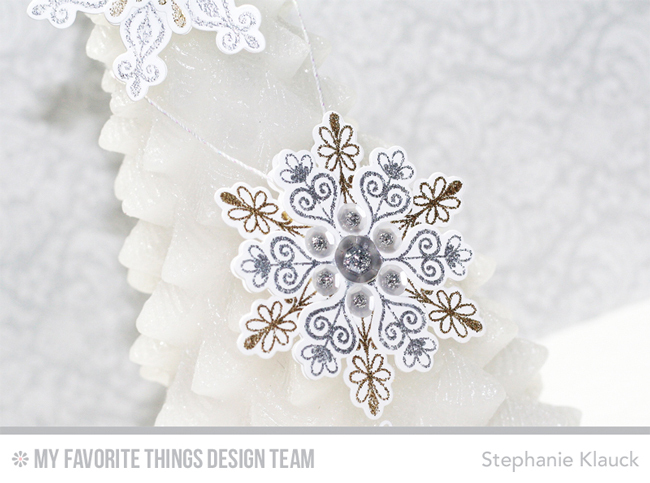 I stamped a bunch of the Simply Snowflakes images and then I heat embossed them with gold and silver embossing powder. Once I had them all embossed, I cut them out with the coordinating die-namics so I could create the layered snowflakes. I also cut some snowflakes from the Stylish Snowflakes die-namics and layered them with the embossed snowflakes to add even more detail and dimension. 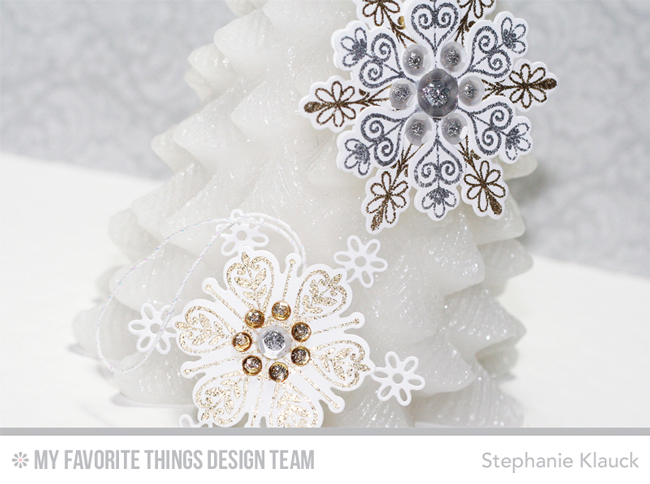 I love the look of the white snowflakes mixed in the with the metallic embossed ones. They look so elegant and pretty. When I created my layered snowflakes, I made sure to make two identical snowflakes for each ornament. That allowed me to glue them back-to-back (so both sides would be finished when hanging on the tree) and it also allowed me to glue the string in between the snowflakes. Beautiful job on the snowflakes. So pretty and sparkly. Awesome snowflakes. Thank you for sharing your ideas. What a great way to make ornaments. These would make good gift tags too for gift bags. Beautiful ornaments! Love the embellishments! Such gorgeous snowflakes! This was certainly a lot of work which was worthwhile because those snowflakes are just gorgeous. Gorgeous!!! When I saw these stamps and dies I thought they'd make some nice ornaments. What beautiful ones you have made! Stephanie! These snowflakes are so beautiful! I'd hang them in my windows, put them on my tree, decorate packages and bottle gifts with them! Beautiful job! Great idea to use them in this way. Beautiful snowflakes! Wow... can't stop looking at this creation! So beautiful!! Great idea to decorate this little tree. Would make a great gift for a teacher, etc. My favorite of the whole release: these snowflakes and their matching dies. Love these beautiful ornaments, Stephanie. These are gorgeous, they would be great filling a whole tree. So gorgeous! I love all things snowflake, and have quite a few in my stash, but these just may have pushed me over the edge! I think I NEEEEED them now! What a great idea!! And gorgeous! Stunning snowflakes! Love this idea! Stunning snowflake ornaments! Very pretty and I love the layering! Snowflake ornaments, totally unexpected. Beautiful projects. I like your elegant snowflakes. These snowflakes are totally on my wish list. So very pretty! Oooooh... that is so pretty! Snowflakes are my favourite Christmas motifs! Everybody likes them and they can be used for any winter makes not just Christmas! Great ideas for tags or Christmas tree ornaments. Such stunning snowflake ornaments!!! Perfect accent for any tree! What a great idea. The snowflakes are so gorgeous. Absolutely fabulous! 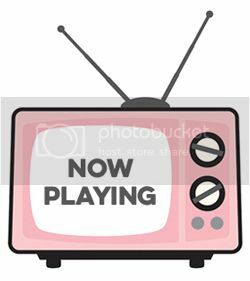 I loved watching the video too. TFS! Clever idea, have not thought of the snowflakes outside of making cards. Thank you for sharing. Love these ornaments. I may make some to hand out to coworkers over the holiday season. Wow! Awesome creativity using the stamps & dies!! Your creation is just beautiful! Lovely snowflake ornaments! Creative and inspirational! Gorgeous ornaments I loved your video. Beautiful snowflake ornaments! The gold and silver is very elegant. Love, love love snowflakes and yours are beautiful. a very pretty way to use the snowflakes! Love the detail you gave these snowflakes! Wow! Adorable card!!! Beautiful snowflakes!!! These are beautiful Stephanie! Love the way you have used the snowflakes! your snowflake ornaments are absolutely gorgeous!! 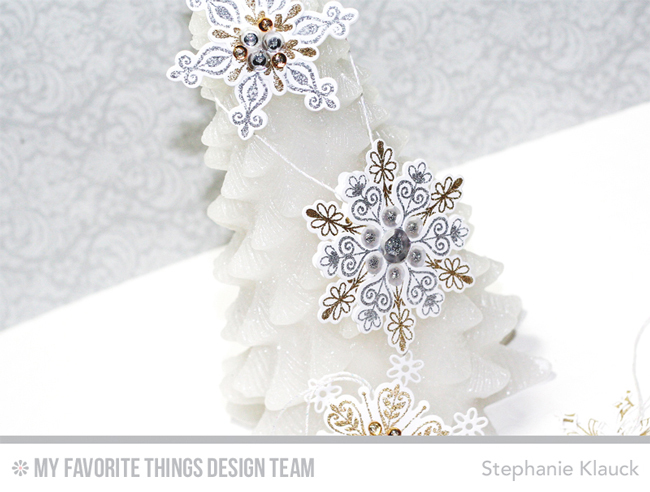 These ornaments are really beautiful, I already admired them on YouTube - I love the gold and silver combo! The snowflake ornaments are brilliant!! I love this different take on the snowflakes! 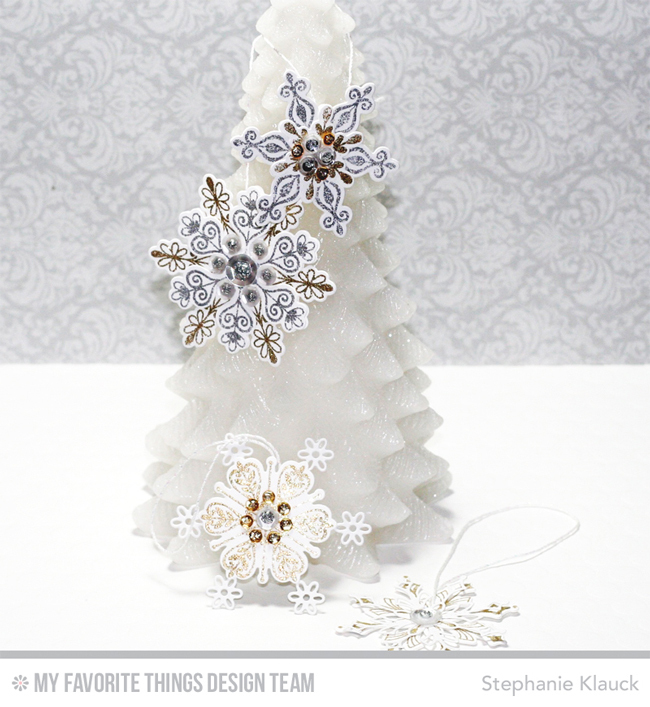 I love papercrafting and this gives me great ideas for my Christmas tree this year!